Final Vision Map showing Frequent Network priority tiers. Jarrett Walker + Associates assisted the Pima County Association of Governments (PAG) in developing a vision for future transit development in the Tucson region. JWA produced an existing conditions report and maps examining current trends, challenges and opportunties for Tucson’s transit system, Sun Tran. Following the release of the report, JWA presented an interactive workshop for regional stakeholders to help them understand the tools and tradeoffs of transit, so that they could provide effective input on their future vision for transit. 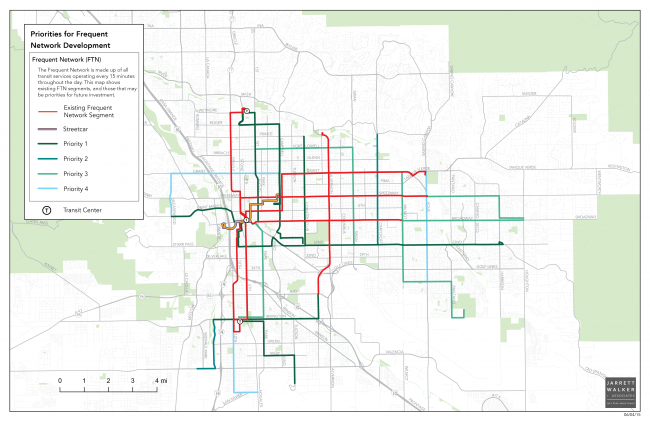 The workshop focused on a transit planning game developed by JWA that enabled participants to allocate new transit service resources across their city, by improving frequencies, creating new routes, or changing the path of existing routes. After the workshop, JWA wrote a report describing the results of the workshop, and conducted a briefing for elected officials on the same material.